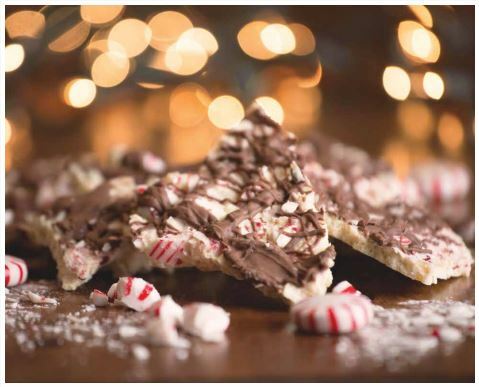 Break the peppermint log into small pieces, lay out wax paper on a cookie sheet or pizza pan, set aside. Break up white chocolate into small pieces. Put into microwave at 50% power, stir and then return to microwave at 50% power for 30 second increments till all melted. Stir in the puffed rice cereal, broken up peppermint pieces and the essential oil. Make sure all the cereal is coated with chocolate. Pour out onto the prepared pan and smooth out till about ¼ ” thick. Break up chocolate piece and microwave in the same manner at 50% power.